Sunday in Cairns today was a bit of a quiet one. As Shane and Stacey have just bought this house they spent the day doing a bit of work in the garden, then we had to do a bit of shopping. We then went and watched Stacey play netball, which her team won by heaps. So seeing it was a quiet one today I thought I would share with you a couple of photos I have taken while I have been here. 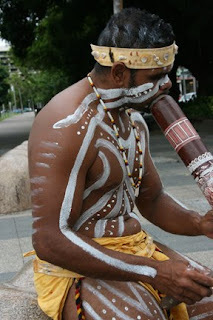 When I am at home in Melbourne and I head into the city I love watching the Buskers so I was pleasantly surprised when I came across this Koori (Aboriginal) fella all painted up and playing the didgeridoo. He was really very good and worth every cent of the money I gave him. and watch a game I just know he is sitting with me – I can really feel him with me. Fabulous photos, Davine! I LOVE the didgeridoo!! That is so cool, all we get here are people beating on empty five gallon pails or what I like to hear is someone who can really play the guitar, now that I could listen to all day. 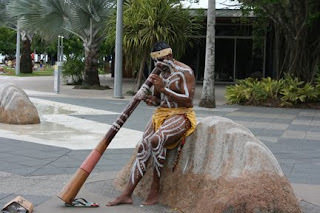 I've heard the didgeridoo before, you would have had trouble prying me away from there! Wonderful to feel your dad still with you watching your game, my mom still feeds me energy as I sit and write half the night away... she also loved to write.